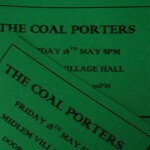 Friday night saw the return of Sid Griffin and the Coal Porters to their favourite venue – Midlem Village Hall. The place was packed in anticipation of a great evening – and we were not disappointed. There were all the old favourites, some new songs from album to be released in September and an outrageous cover of Paint it Black (Na-Na-Na-Na-Na-Na-Na…..)!! 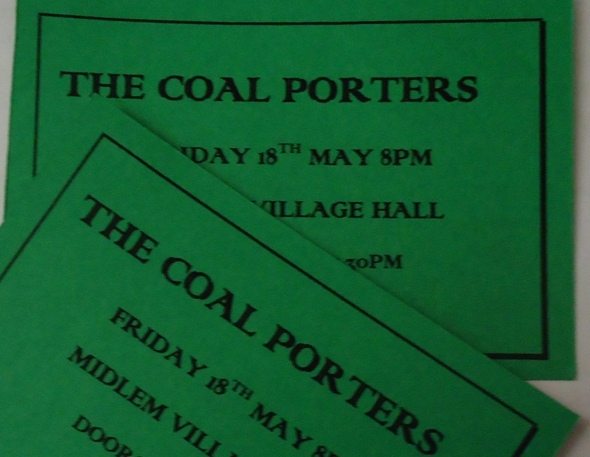 For those of you who missed the gig but might be intrigued who the Coal Porters are then have a look at the website – Coal Porters. And if you want a sample of their music then here is one of our favourites – Closing Time Genius. Many thanks to Phil & Patricia (who sadly missed the gig), Midlem Hall Committee, the audience and especially the Coal Porters! You helped us raise a fantastic £675! !